Every year hundreds of faces light up with joy at the Holiday Bike Drive. 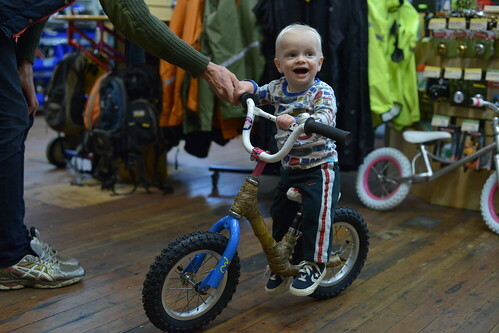 Kids smile, laugh, and some of them earn their very first bike. At the Community Cycling Center, we can’t help but smile, and be proud of the work we do. 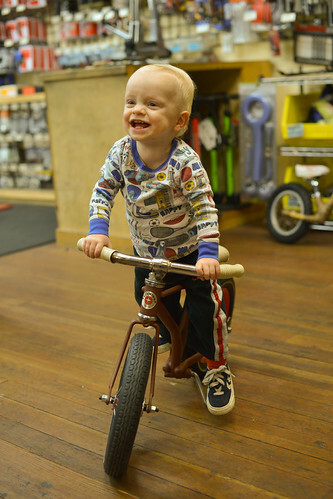 We love the bicycle, we love what a bike can do for you, and especially the joy that 2 wheels can bring a child. That’s why five staff members of the Community Bicycling Center bike shop challenged one another to a ‘Balance Bike Build-Off’. 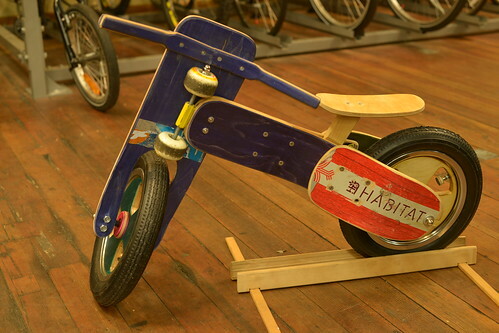 The idea was to spend 3 weeks to design and fabricate unique, handcrafted, and totally awesome balance bikes, then to auction them off in support of the Community Cycling Center’s programs and Holiday Bike Drive. What is a balance bike? It is the most basic member of the bicycle family, with no pedals or gears and a seat low enough to plant both feet firmly on the ground. This is what makes them great to learn the hard part of riding a bike, balancing, before learning the easier part, pedaling. 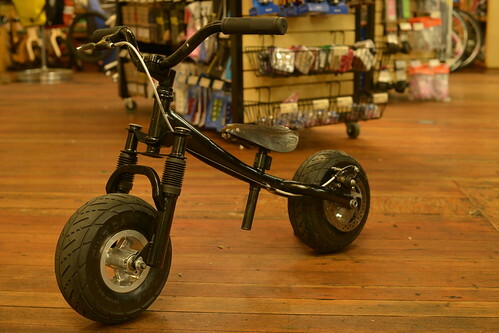 There are no other balance bikes like these anywhere in Portland (or the world). Each one is a completely functional piece of art that took many volunteer hours to make. And they are all being auctioned off between now and December 17th as part of our Winter Campaign. That’s right. 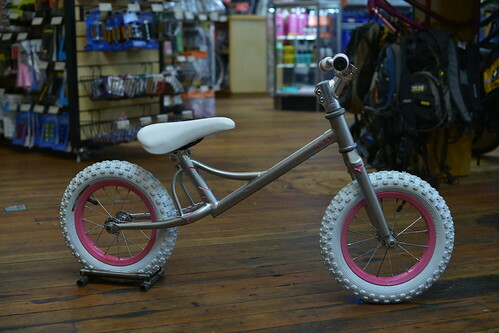 You have the chance to bring these one-of-a-kind balance bikes home. The best part? Your bid has a significant and positive impact on your community and the Community Cycling Center. 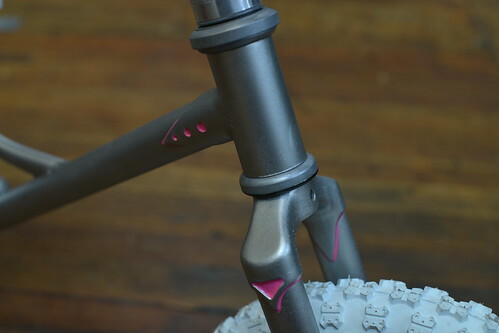 Description: In making Pearl’s Bike, TimTim tried to work from things that inspired him about frame building. In particular, he looked to the work of Claude Butler — a renowned builder in the 30s – mid 50s. He was an early adopter of bi-laminate construction methods. This method allowed for strong joinery, while at the same time being very pretty. 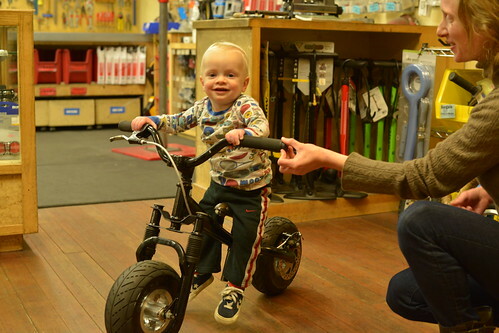 Both of these qualities attracted TimTim when it came time to build his balance bike. 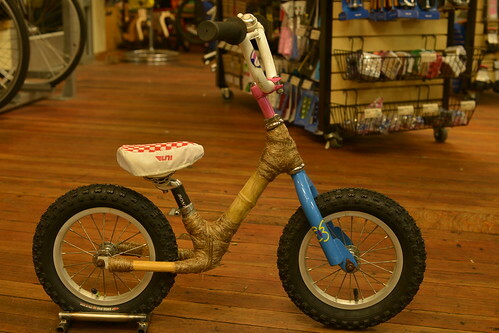 Description: This bike is made completely out of skateboards. 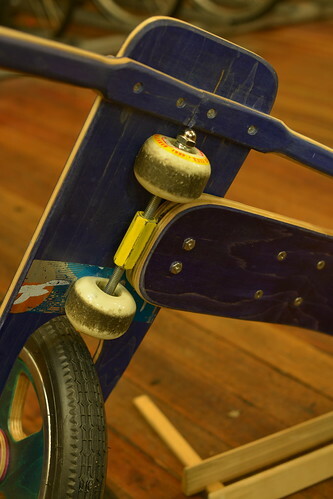 Even the steering bearings are made from skateboard wheels and bearings. 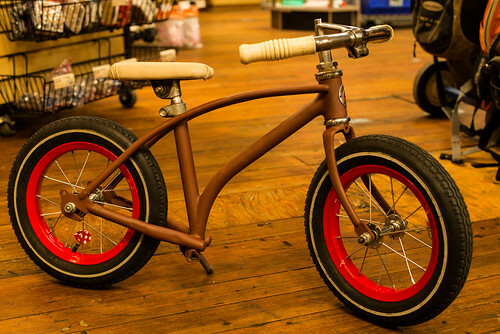 James carefully shaped the rest of the bike from whole and partial skateboards using a band saw. No other kid on the block will have an Ollie like this one. Description: Deconstructing a full sized Schwinn down to it’s bare components, Evan preserved much of the original Chicago Schwinn joinery in this balance bike. 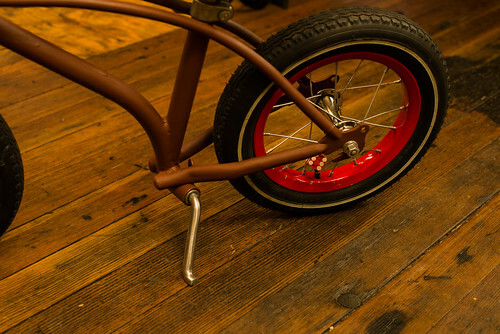 In reconstruction, Evan kept with Schwinn style, keeping all his new joints seamless and creating a miniature one-of-a-kind Ratrod. Original Schwinn parts include kickstand, handle bars, headset, and frame. The saddle is made from a cut down from a person’s banana seat – also from a Schwinn. 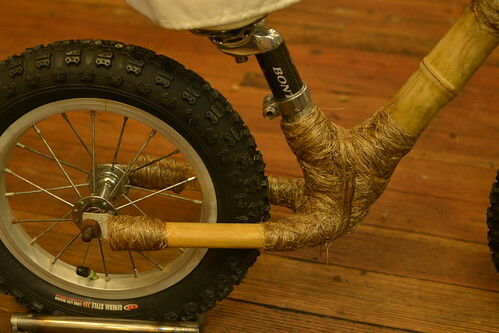 Description: Fascinated by the idea of using a non-traditional frame material and keeping things as natural as possible, Forrest built the body of his frame from bamboo while wrapping all of his joints with manilla rope fibers (from banana leaves) unwound one by one from the original rope. 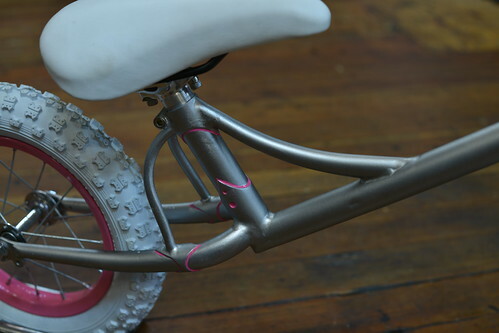 The result is semi-organic joinery that is way beyond cool, and, as far as we know, found on no other Balance Bike. Description: The MicroFat has fully functional suspension, disc brakes, and 3 inch tires. 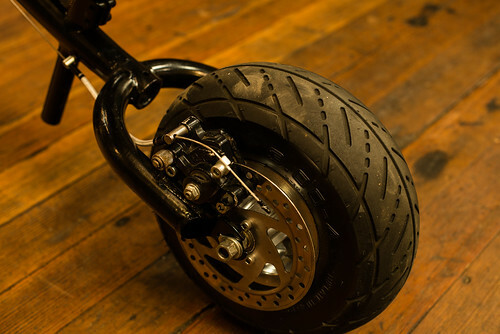 Made from all up-cycled materials, the MicroFat’s wheels came off of a wrecked Schwinn electric scooter, the saddle is a carved down Brooks, and the suspension fork off of a bike that was too far gone for use in Holiday Bike Drive. The wheels proved as much of a challenge as inspiration; in order to make the wheel fit, he had to cut the fork up and make it wider. 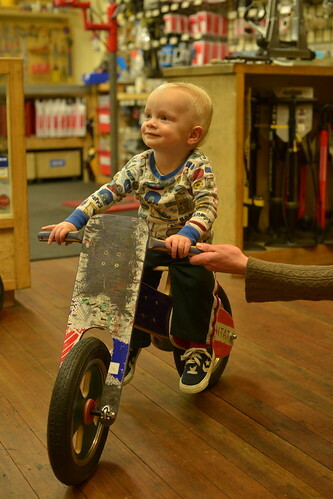 All balance bikes will be up for display in our shop until the auction ends on December 17th. If you want to see, feel, touch, taste (just kidding) any of the bikes, come on in and take a look. But you don’t have to come in to bid. You can call at: (503) 287-8786 or email us at balance.bike@communitycyclingcenter.org with your bid.